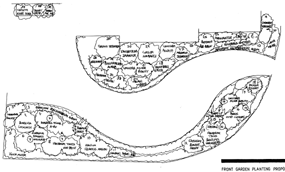 The following outline is intended to give you an idea of how the full garden design process often works. The service offered is flexible however, and can easily be adapted to suit your individual needs. A chance for you to view an extended portfolio, outline your requirements, discuss costs (design and construction) and have any questions answered. It also allows me to see your garden! If you decide to commission me to produce a design for you, the maximum fees for my design work to an agreed stage will be put in writing for you before continuing to the development of a brief. A detailed discussion of your likes, dislikes and practical requirements in relation to budgetary considerations. It is helpful if you can write down your thoughts on these matters prior to this meetingIn practice this discussion can sometimes take place during the initial visit, once my clients have decided to proceed. Once a brief is in place I will then survey your garden and spend time getting to know its potential. While this again can take place during my first visit to your garden, the process is weather and time dependant. 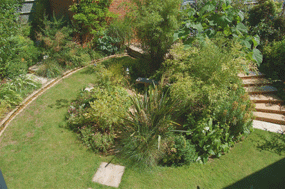 It can also be useful to visit on more than one occasion to see the garden under different conditions. 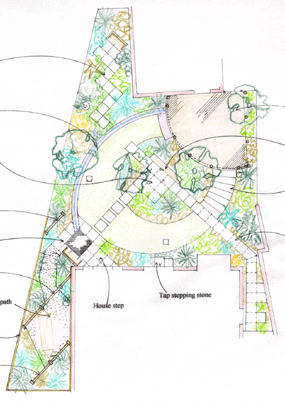 Once I have all the relevant information available I will develop an overall layout scheme for your garden (sometimes illustrated with rough sketches) for you to absorb and comment upon before settling on an AGREED LAYOUT, for which we can then develop a specification. 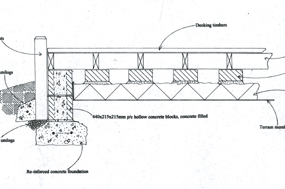 The plans and sketches are not produced to look pretty hanging on the wall as decorative items; I consider it more important that they should be precise and easy for a contractor and my clients to interpret. Compare this image taken from a first floor window with the plan and sketch. 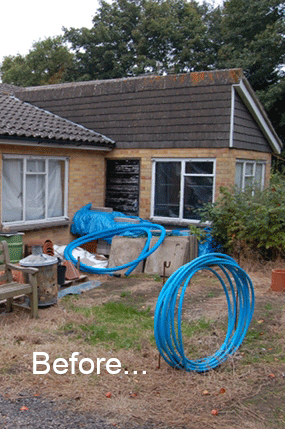 A written specification together with working drawings (example below) based on the agreed layout will enable landscaping contractors to provide quotations for the agreed works and ensure that they carry out the construction correctly. It also reassures both my clients and the contractors that the latter are competing on a level playing field. 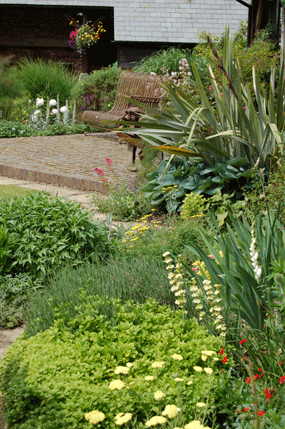 Planting proposals can be prepared to furnish your agreed garden layout. Planting is carefully chosen to reflect your requirements and to withstand the prevailing soil and anticipated climatic conditions. 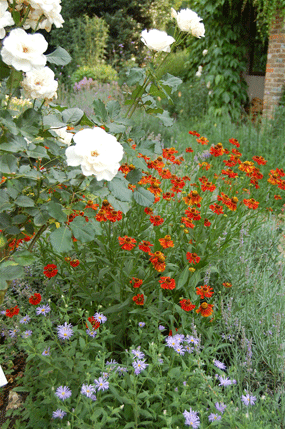 As with the other documents, I do not waste your time and money making the planting plans look wonderful; I treat them more as a tool to perform a particular job (example above). 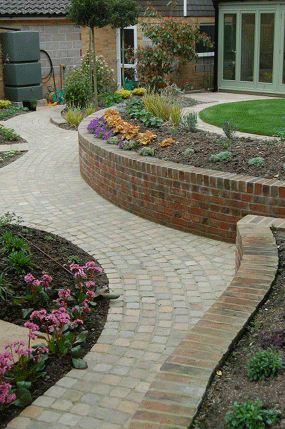 If required I am able to help with finding and briefing suitable landscaping firms in order to obtain quotations for the construction of your garden. Whenever possible I try to get my clients to meet the contractors when they visit to assess your site for pricing, as the chosen company might be in your garden for some time and it is useful to have a personal link with them before work starts. I usually accompany them on this visit in order to introduce them to you and answer any technical questions they might have. 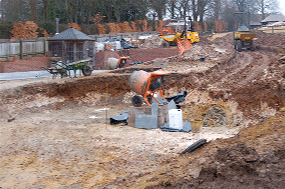 With the quotations available and some idea of the individuals concerned you will then be in a position to appoint your favoured landscape contractor. Please note: The introduction of landscape contracting firms cannot imply a guarantee of the standard of their work, although wherever possible efforts are made to only suggest known and reputable firms. During construction, periodic checks on the progress of work can help ensure that everything runs smoothly and that any problems encountered are overcome suitably. I can usually arrange the supply of plants to furnish agreed plans. Having spent time working in the wholesale nursery trade, I can find you good deals on plants while at the same time ensuring that plant quality is maintained. Some clients ask me to buy some of their plants at larger sizes. This can create an instant visual impact in the garden but does cost more. As a very rough rule of thumb, in order to double the size of a plant (in bulk as well as height), one might have to spend four times as much money. The cost implications of any particular scheme will be discussed with you throughout the design and purchasing processes.